Hi everyone!! How are you doing? I am feeling super hot, because it’s getting hotter every day here. So I am mostly indoors and trying to do nothing. But I don’t seem to be able to do that, because my kids want me to do stuff and run around all the time :). At least they get an afternoon nap, so I can chill a bit then. And now the mani. I don’t know why but lately I feel doing manis that aren’t that summery at all. Today I did one with the Ultra Chrome Flakies polish and if I hadn’t put a white base under it, it wouldn’t be summer mani at all. So this is what I did. On my pinkie and ring finger I didn’t apply any base and on my other three nails (thumb is not visible here) I applied white polish. I used KBShimmer – Eyes White Open. 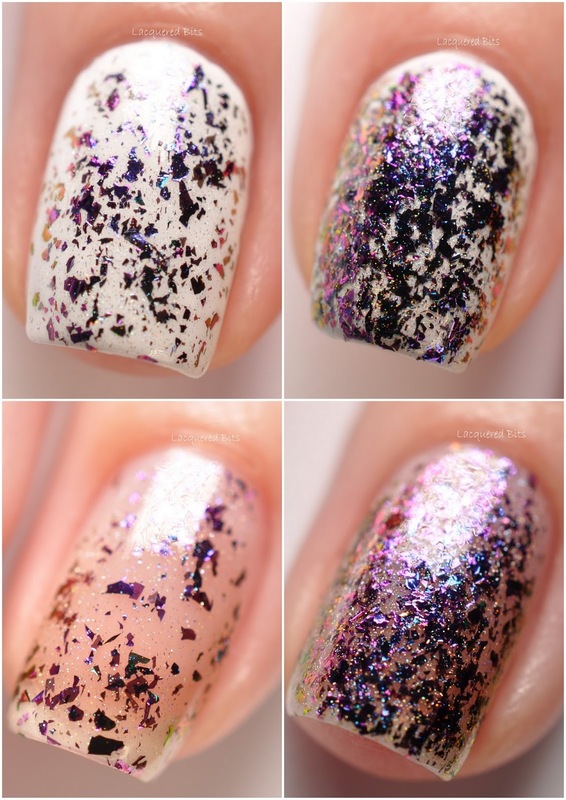 And of course the polish that I swatched is ILNP – Paradox (H). 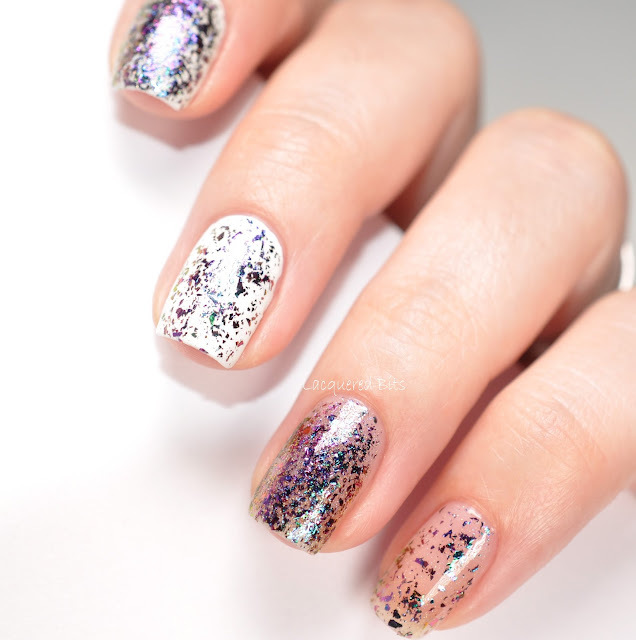 Beautiful flakie polish that has colour transition from green, blue and all the way to the purple. Amazing! It was easy to apply, I had no issues getting flakes on to the brush. And the brush was easy to work with. On my index I had white base and then two coats of Paradox (H) over it and on my middle finger I applied one coat over white base. On my ring finger and pinkie I decided to go without the base polish, so that you could see how it looks on bare nails. And it looks gorgeous too. Ring finger had two coats of Paradox (H) and pinkie only one. The reason I did it like this is that you can see how it builds up on its own or as a topper over any base polish. 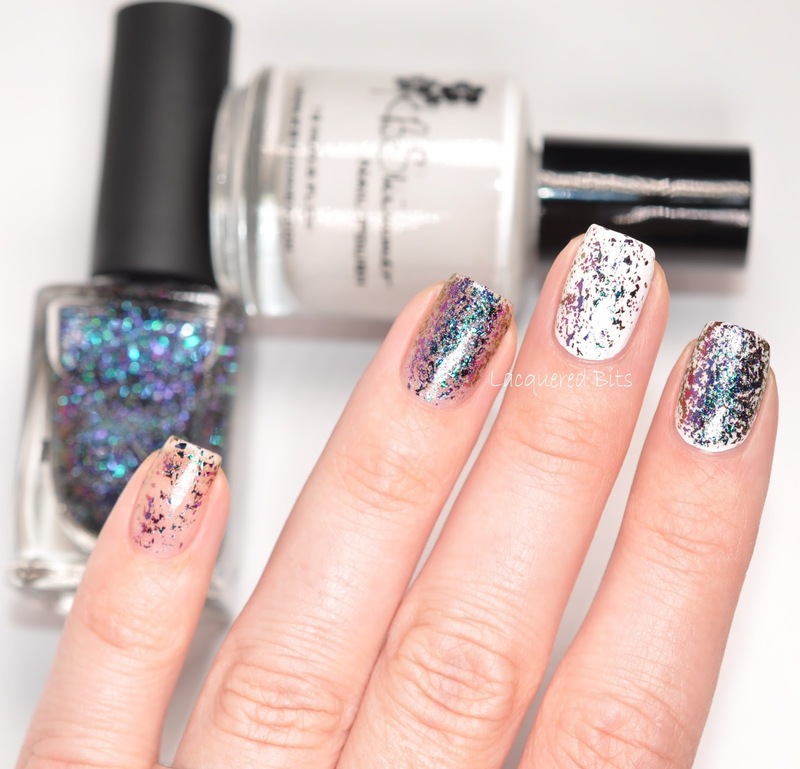 What are your thoughts on these flakies polishes that are so popular in indie brands? Do you own any, and do you like them? I like them, and I have a few more at home to swatch, but I don’t think I need any more, because they are all quite similar. But from all the brands that offer them, I like ILNPs the most. I think their colour range is amazing! So pretty! I just recently purchased ILNP Spring Collection 2015 and I love the polishes.